The fact that Hearse isn't one of the most well-known Swedish bands should not be a reason not to check them out. In only eight years of existence, Single Ticket to Paradise is the band's already fifth release. Not that surprising though, given the experience of the band members; the death and roll ensemble is fronted by former Arch Enemy vocalist Johan Liiva. 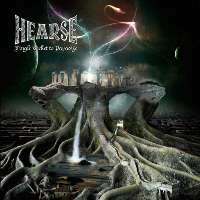 So, Hearse are a band with an extensive experience in the metal milieu, and this can be heard easily. The whole record has a classical mood, backed-up by an ounce of doom, a distinct, sure and experienced sound, some times Entombed-ish, and a great hardcorish voice, also sometimes reminding of Lemmy Kilminster's. This interesting combo makes of Hearse a band to respect and of Single Ticket to Paradise an album to let roll. Are they to play live in your area, be sure to pay them a visit.